Baby Aditya is only 5-months-old. 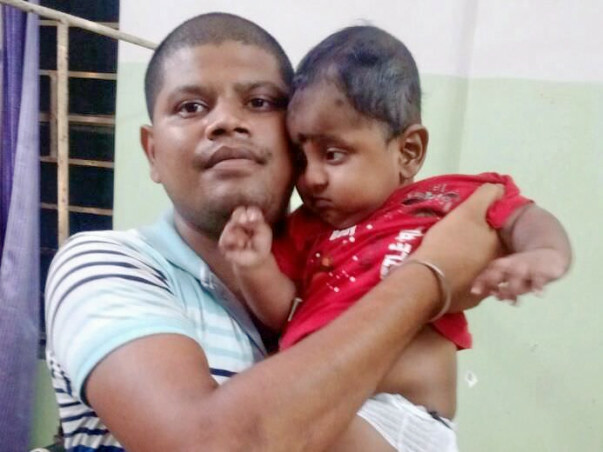 He is suffering from a condition known as Craniosynostosis, which is a swelling in the head, and needs to undergo an urgent surgery. His father Kalpo, a sweeper has mortgaged all his belongings. The condition was not diagnosed earlier by local doctors. The father has already spent most of the money on travelling from one place to another, desperate for a diagnosis. After several local doctors diagnosed their 5-month-old with an accumulation of water in the head, but could give no definite diagnosis. 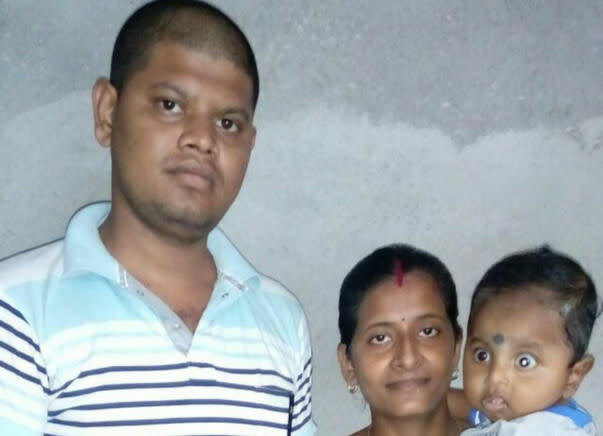 Desperate, the couple rushed to Bangalore, where their baby was finally diagnosed with an unusual condition. Aditya’s father Kalpotoru is a sweeper. He earns hardly Rs. 2000 a month. Desperate to save his only child, the man has mortgaged all of his belongings. Unfortunately, most of the money he got was spent on travelling to get a proper diagnosis. The baby now needs an urgent surgery, in order to live a normal life. Kalpo is very apprehensive about his baby’s future, since the last checkup showed the condition has already started to affect baby Aditya’s brain development. A surgery to correct the structure of the skull would cost over Rs. 1 Lakh. The poor sweeper has no way to save his baby without our help. 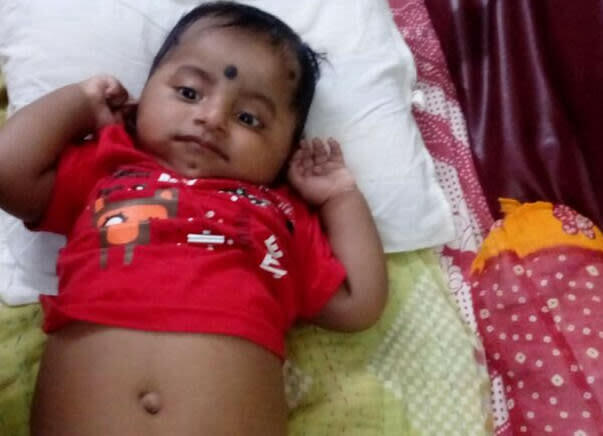 Any contribution towards this fundraiser will go towards baby Adithy’s surgery. 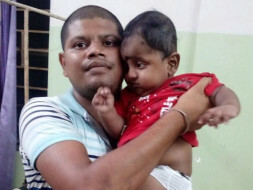 Your support can help a sweeper save his only child’s life. 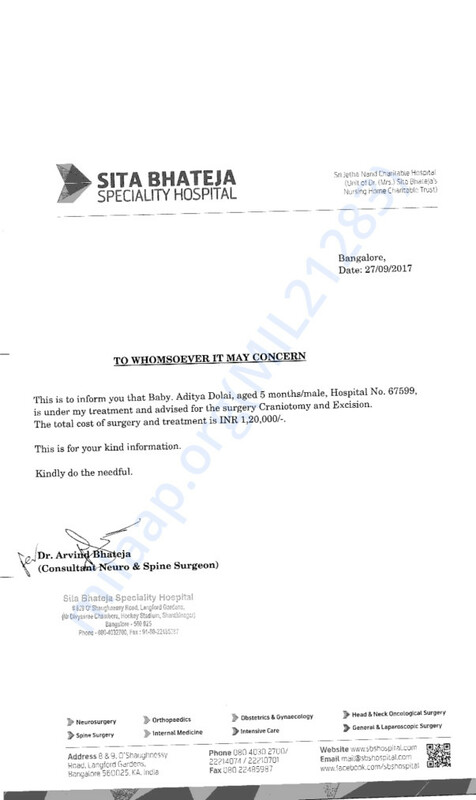 Here is a quick update on Aditya. Aditya is currently at home and is doing good. He visits the hospital for regular check-ups. The doctor has advised for the surgery soon. We will keep you posted on further details once his tests are completed.